Spring is here. The weather is warming up! What better way to spend your spring and summer than out on your patio, grill out perhaps and sit on your gorgeous new treated wood patio furniture? 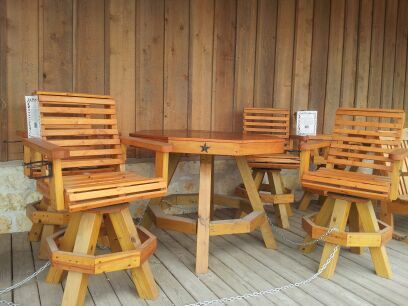 Lochte Feed & General Store now has patio furniture available from Diamond Dale, Inc. and it’s made in Texas! 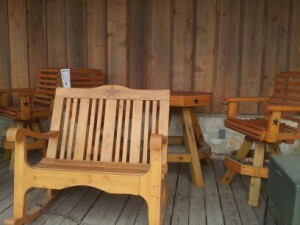 We have beautiful tables, swivel chairs, benches, etc. Come on out and take a seat and bring some home. This entry was posted on Tuesday, March 25th, 2014 at 10:48 am	and is filed under News & Updates. You can follow any responses to this entry through the RSS 2.0 feed. Both comments and pings are currently closed.